This national investigation utilizes qualitative data to evaluate an implementation model regarding factors influencing provider use of two evidence-based treatments for posttraumatic stress disorder (PTSD). 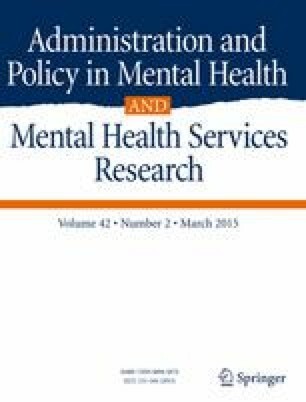 Semi-structured qualitative interviews with 198 mental health providers from 38 Department of Veterans Affairs’ (VA) residential treatment programs were used to explore these issues regarding prolonged exposure (PE) and cognitive processing therapy (CPT) in VA residential PTSD programs. Several unique and some overlapping predictors emerged. Leadership was viewed as an influence on implementation for both CPT and PE, while a lack of dedicated time and resources was viewed as a deterrent for both. Compatibility of CPT with providers’ existing practices and beliefs, the ability to observe noticeable patient improvement, a perceived relative advantage of CPT over alternative treatments, and the presence of a supportive peer network emerged as influential on CPT implementation. Leadership was associated with PE implementation. Implications for the design and improvement of training and implementation efforts are discussed. This project described was supported by Award Number RC1 MH088454 from the National Institute of Mental Health (NIMH). The content is solely the responsibility of the authors and does not necessarily represent the official views of the NIMH, the National Institutes of Health or the Department of Veterans Affairs. Department of Veterans Affairs. (2013). Dissemination and education within the VA. Washington, DC: Author. Retrieved from http://www.ptsd.va.gov/about/major-initiatives/education/dissemination_education_within_the_va.asp.